So a little more about the sky blue in my last blog post. I tend to go through color phases, and currently it is sky blue. Or maybe you could call it pool blue. 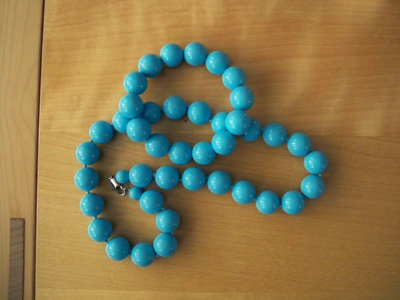 It seems to have started with this necklace and bracelet. 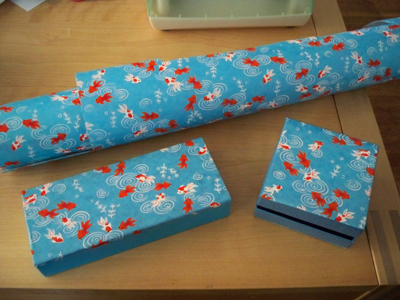 Then I found this hand screened paper with goldfish on that I have been using to decoupage little boxes. The latest is my new suitcase for all the traveling I have been doing. I added the stickers. I am totally with you on this color, I'll be moving soon and this is one of my picks for somewhere in the house..well sort of this color mixed with Robins eggish color. I want to try that new safe paint that eliminates odors. (random I know) but I love your blog and your creativity! Very cute colour and the best part is it suits you! Love the suitcase and the little boxes - very sweet. i heart the suitcase! the color makes me want to go to the islands. 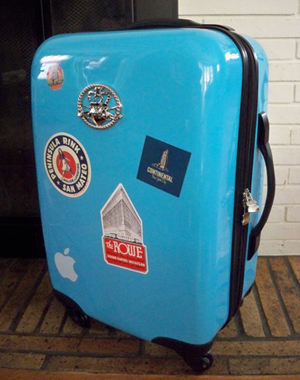 Love the suitcase, but even more than that I LOVE that you've put stickers on it! So retro! Hi! where did you get the paper? I got identical paper in japan, but i'd love to have a source in the U.S.
Where is the suitcase from? Can you tell me where you found the goldfish paper? Thanks!